One of the most important aromatic compounds in organic chemistry is benzene. The six-membered hydrocarbon, with the structural formula C6H6, proves to be omnipresent if organic chemistry is in question. Benzene is one of the simplest (organic) aromatic hydrocarbons. The six carbon atoms form a ring structure; and also have one hydrogen atom linked to each of it. Other aromatic hydrocarbons are derivatives of the six-membered structure, benzene, only. 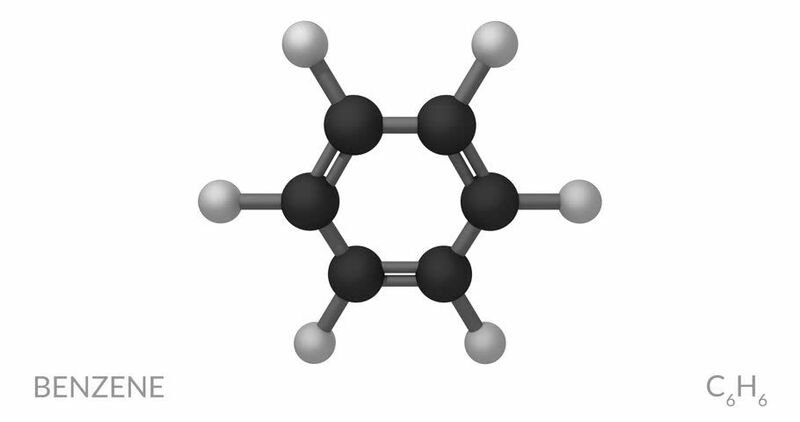 Benzene lays the foundation for many other aromatic hydrocarbons. The structure of benzene was not easy to elucidate. The structure of this aromatic hydrocarbon, with unusual physical and chemical properties, took years to determine. Michael Faraday, a British scientist, is credited to isolate benzene in the year 1825. It was described as a stable compound which also formed a triozonide. The formation of the triozonide structure of benzene confirmed the presence of three bonds. Not only does benzene serve the purpose of being an elementary petrochemical, but it is also the natural component of crude oil. Abbreviated as PHh, benzene is a colorless and an inflammable liquid with a characteristic aroma. The structure of benzene is given above. The chemical formula of benzene is C6H6. It is a six-membered carbon atom and has an average mass of about 78.112. When benzene was discovered, it was found to yield only a single monosubstituted product. The formation of a single product revealed a lot about the aromatic hydrocarbon; it was concluded that all the carbon and hydrogen of benzene were identical. It was August Kekule who put forth the structure of benzene. It was proposed to possess a cyclic arrangement of carbon atoms. Each carbon atom is attached to hydrogen atoms. The single and double bonds alternate each other. Thanks to the Kekule structure, two isomeric forms of the derivative of benzene- 1,2- Dibromobenzene– occur. One of the bromine atoms is attached to the singly bonded carbons while the other one is attached to the doubly bonded carbon atoms. Kekule is also credited to put forward the theory of oscillating nature of double bonds in benzene. The Valence Bond Theory describes the delocalization of the electrons in molecules. It highlights and contrasts the Lewis structures which represent a particular molecule. It is a phenomenon whereby a single molecule exists as a combination of two or more compounds; these compounds differ only in the distribution of the electrons and not of atoms. The different structures of the same molecule are called contributing structure/resonating structures /canonical forms. The contributing structures have a double head arrow (↔) between them. The hybrid structure is represented as a hexagonal structure with a circle/ dotted circle inserted in it. This circle/dotted circle represents six electrons. The six electrons are delocalized between the six carbon atoms of the hexagonal structure, benzene. overlap of p-orbitals of C2 – C3, C4 – C5, C6 – C1. The technique of X-ray diffraction is critical in determining the internuclear distance between the carbon atoms. Why is benzene so stable? The six π electrons can migrate freely around the six carbon nuclei. The nuclei of the carbon atoms attract the electron cloud of the delocalized π electrons more strongly than the electron cloud localized between the two carbon atoms. Therefore, the structure of benzene is more stable because of the presence of delocalized π electrons. Presence of (4n + 2) π electrons in the ring where n is an integer (n = 0, 1, 2, . . .). It is a non-polar compound. It is immiscible with water but dissolves readily in the organic solvents. It produces a sooty flame on combustion. The incomplete combustion of compounds results in the formation of benzene. 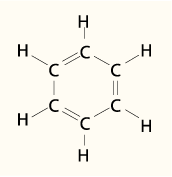 Benzene also occurs extensively in volcanoes, forest fires, cigarette smoke, gasoline, and crude oil. It is also employed in the industry for the manufacture of various products. Manufacture of Tire/Rubber: Various steps in the production of rubber involve the utilization of benzene. Adhesion substance used to attach rubber soles also contains benzene. Paints/Printing Products: Various products employed in the print industry contain benzene. It is also a constituent of various painting products. Fuel Oils: Fuel oils like petroleum, gasoline, and kerosene contain benzene. Benzene is also a precursor for the production of asphalt. Plastics: Benzene is used widely in the plastic industry. The production of products like nylon, styrene, and Styrofoam also require benzene. Chemicals: The chemicals like insecticides, pesticides, detergents, dyes, and fertilizers require benzene in the production process. Automobiles: Benzene is used in the repair and maintenance of the automobiles.